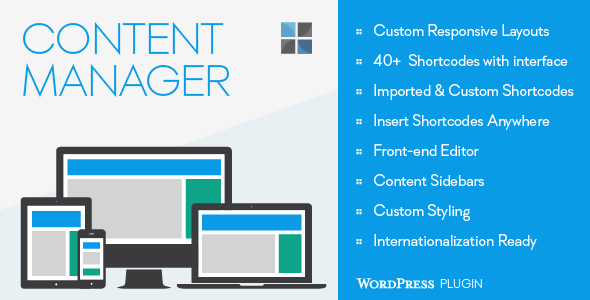 If you are looking for an unique way to showcase your content with amazing responsive design, check out this plugin called Content Manager for WordPress. A drag and drop content manager plugin which provides you number of options to play around with your website and content, it comes with more than 40 shortcodes. Creating custom responsive layouts is real easy with this amazing plugin in just a few clicks. Once your layout is ready, fill it up with content. Tons of ready to use shortcodes are waiting for you to create a great looking page with lot of customization options. Edit your layouts and content in the front-end of your site, no need to go to WordPress admin area or write a code. Creating responsive layout is just a matter of few clicks with the drag and drop system of this plugin. Go to OTW Grid Manger metabox and start creating your layout, you will never have to write any code. This plugin allows you to insert sidebars anywhere in the layout created by OTW Grid Manger, this feature will provide you additional benefits to show ads or any other widgets of your choice within the layout. Front end grid manager allows you to create and re-arrange layouts in the front end without any coding, this system is really easy to use and fun. One of the most important feature and advantage of this plugin is the use of shortcodes, this plugin comes with 40+ amazing shortcodes which you can insert anywhere in the layout. Also, another amazing feature is the custom shortcodes, content manager for WordPress plugin allows you to add your own shortcodes easily. You can import shortcodes from other plugins and themes easily to use it with content manager plugin which is an outstanding feature of this amazing plugin. The plugin will follow your theme styling for the main html tags so, whatever you create with the plugin fits your theme design.